Chris Hughton says it will be Brighton & Hove Albion's home form which keeps them in the Premier League this season. The Seagulls are 13th in the top flight, seven points clear of the relegation zone, with 14 league games remaining. Brighton now have back-to-back home matches against Watford today and Burnley next Saturday. Albion have lost just seven of 30 home games since promotion to the Premier League and only one of those - to Leicester last season - was to a side outside the top six. 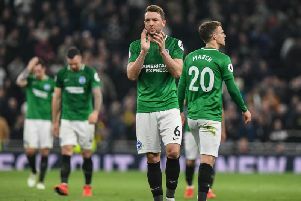 Seagulls boss Hughton said: "It's a fabulous record and it's what kept us in the Premier League last season and I still feel if we are to stay in the Premier League this season, it will be very much down to our home form. "That will probably be exactly the same as some other teams around us. "It's been very good for us and it will need to continue to be very good for us." Hughton is pleased this afternoon's game has come around quickly, after the 4-2 defeat at Fulham on Tuesday when the Cottagers scored four second half goals. He said: "When you're on the back of that second half, you want the next game to come round as quick as possible. "We had our post-Fulham meeting before training (on Thursday) where we went through the areas where we didn't do so well. "The players at this moment are in good spirits. I think they understand it was a bad day for us and that can happen. "We've now got a game to I don't even know if it's make amends, but we've got to try to get three points, which will help us enormously."